Anderson was one of the first African-American players in the CFL, folowing closely on the footsteps of Herb Trawick in 1946. 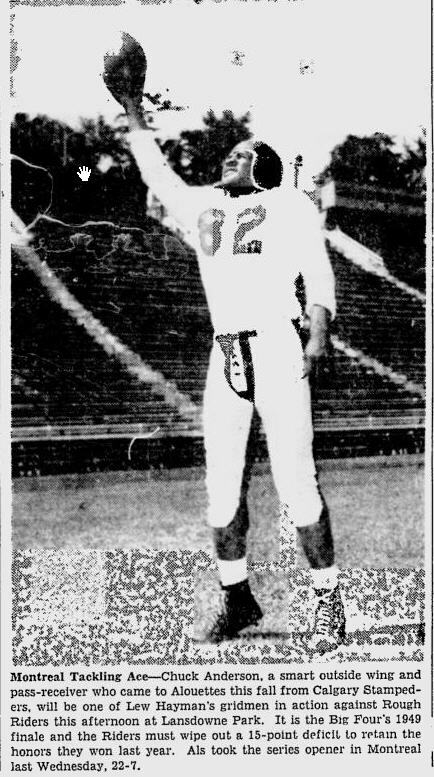 After playing his colege ball at mighty Ohio State, Chuck Anderson came to the CFL in 1948 where he played with the undefeated Stampeder team that won the Grey Cup. Anderson was named a West all-star at center that season (there were no CFL all-stars at that time). Anderson moved on to play for Montreal in 1949 and won his second Grey cup that year with the Als. Anderson played with the Als in 1950, but was waived and had a tryout with Hamilton. Anderson returned to play one more season with Montreal in 1952 and then played one year in Ottawa in 1953..
Chuck Anderson passed away on February 13, 1975. No official games played stats were kept in the East until 1960. The above numbers are unofficial and taken from the 2006 Montreal Media Guide.